...before it passes you by. I placed these cozy cottage here because of a couple of incredulous comments I received that I deleted, about cottages. These young women stated that a cozy cottage would not really help a depressed woman, but I submit that this symbol of life at home is exactly what is lacking in the lives of many frustrated and depressed young women. Throughout history, women married young because they were finished with childhood and had the ability and the inclination to start a home of their own. Young men also were eager to build their own houses and have a wife and family. This was changed in the 20th century by modernists who thought education was more important than marriage, home and family. The focus would be on "bettering" oneself through education. Young women are convinced to sit through their child bearing years and give their years of true vitality to classroom activity, under pressure to get college degrees and careers. They are expected to earn a living on their own, pay for their housing, and eventually get married and have children. They must establish their careers and that takes time and money and concentration, and the home once again takes second place. This also cheats the young men, who need to get married and have children while they are young. When women are not able to have children, they still are benefited by home life, which is very good for their strength and their general health. The workplace does not provide all that a woman needs for her well-being, but the home, when managed as it was intended, does. Between the ages of 15 and 35, women are supposed to increase their load-bearing exercise, and it is not a coincidence that this is also the time when women of the past would have been carrying their children around, lifting them up, and playing with them. The exercise of the fitness salons does not have exactly the same benefits as the exercise gained in caring for the home and property. The book, "Home Comforts," shows the intricate details of running a home, and if it were put to the test, would be greater than most college textbooks. I have been deliberately misunderstood when I mention education. Each time I do, I get a pile of people on here shrieking in protest and casting dust wildly into the air, jumping around like little banty hens, protesting that I am "anti-education." I am not. I am just saying that the system of education either needs reform, or we need to seek alternatives. Sometimes these girls, on summer vacation after 9 months in school, (that is an interesting number, is it not?) heavily laced with Karl Marx beliefs that women aren't contributing anything at home, will read the homemaking blogs and see women their own age whose lives are well under way. With husband and children and a little cottage ,they are making a place where they spend many happy hours. These girls looking in may become envious. Envy is the main sin of Marxists, who think this world should be run in a completely different fashion than the way God designed it in the form of marriage, home and family. There are alternatives to everything, if we would dig a little deeper. At a young age when women need to be active, and need to have love in their lives with a good husband, and children around them and a home to care for, they are told it is inferior to marry and be at home, and are instead convinced they must be shut away into college dorms that make cattle and sheep pens look roomy, and forced to study in a distracting and stressful atmosphere. The piles of assignments heaped on them make it impossible for them to love life and enjoy beauty. Their future is sabotaged from the beginning of education with loans that will weigh heavily on their finances for many years and may effect their chances of having one of those cozy cottages when they get married. After the years of study are over, they still do not know how to live their lives, manage their money, get married to a steady and good man, and raise a decent group of children. They will, however, be qualified to work their youth away at jobs and hardly have time to think. They will be qualified to serve the public in some capacity but have little time or stamina left for their home life. Such a load can only be borne a certain period of time before they finally break down, either mentally or physically. I have seen this mental breakdown through the comments that come through when I dare to suggest that young women would be far more involved in real life through the home and family. Even at home with their parents, a young woman can contribute a lot that will be mutually beneficial to them. The pressure that young girls are put through from an early age, can lead to many of them taking prescription drugs to reduce the tension, drugs that they find very difficult get out of their lives. The stress of studying and working and trying to make ends meet also causes them to want to cut loose and party, rather than seek the refuge of a good home life. College and career can wait: marriage and homemaking cannot. One reason for this is biological, and another reason for this is interest level. By the time a girl has gone through college and career, she does not have the skills or the interest for marriage and home life. Homemaking is quite different than classroom activity, as our Mrs. Alexandra, who was once a college professor, can tell you. It takes a lot more knowledge and a lot more stamina, to be make a success of home life, as well as wisdom, which will not be learned in highschool or college. I have been attacked for taking the stand that getting married young and making a home for a husband, caring for him and enabling him to take care of you and buying a cottage for two, but I challenge you to find a popular artist to day that wants to paint pictures of the workplace, a songwriter who writes about woman at work, or a poet who pens praises of working women. Today, Thomas Kinkade, Susan Rios, Robert Duncan, Sung Kim, Richard Burns, paint beautiful cottages. I suspect their beauty alone is not all there is to it, but what they represent: marriage, home and family. The best thing a young woman can do is opt for marriage, home and family while she is young. If that doesn't happen for them, they can go home to their parents and be a help to them, and get themselves out of a system that seems to be defeating them. That cozy cottage is not held out for them as something to strive for, in the world of apartments and parties, but one day they will wish with all their hearts that they had aimed for that peaceful resolution and put all their energy and money into acquiring it, rather than the elusive success that they are told their student loans will one day bring them. They really need to grasp ahold of life before it passes them by. I placed these cozy cottage here because of a couple of incredulous comments I received that I deleted, about cottages. These young women stated that a cozy cottage would not really help a depressed woman, but I submit that this is exactly what is lacking in the lives of many frustrated and depressed young women. "Serenity Cottage" by Richard Burns from http://www.allposters.com/ For more cottages, go to allposters, click on "fine art" and type in "cottages." Young women are convinced to sit through their child bearing years and their years of true vitality in classrooms, under pressure to get college degrees and careers. They are expected to earn a living on their own, pay for their housing, and eventually get married and have children. They must establish their careers and that takes time and money and concentration, and the home once again takes second place. This also cheats the young men, who need to get married and have children while they are young. College and career can wait: marriage and homemaking cannot. One reason for this is biological, and another reason for this is interest level. By the time a girl has gone through college and career, she does not have the skills or the interest for marriage and home life. Homemaking is quite different than classroom activity, as our Mrs. Alexandra, who was once a college professor, can tell you. It takes a lot more knowledge and a lot more stamina, to be make a success of home life, as well as wisdom, which will not be learned in highschool or college. I have been attacked for taking the stand that getting married young and making a home for a husband, caring for him and enabling him to take care of you and buying a cottage for two, but I challenge you to find a popular artist to day that wants to paint pictures of the workplace. 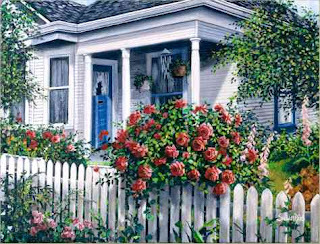 Thomas Kinkade, Susan Rios, Robert Duncan, Sung Kim, Richard Burns, who paint cottages today, are certainly enamoured with them. I suspect their beauty alone is not all their is to it, but what they represent: marriage, home and family. I've known many brilliant girls who got degrees and claimed to be very successful in business, but they were not successful in relationships and were not able make wise choices regarding husbands and were not able to train and teach their own children. Today, there are many women who have chosen home, and they are both able to teach their own children and maintain a stable marriage. It is shocking to see these brilliant professors, judges, lawyers and so forth, that element of society that is supposed to be smarter than the rest of us and somehow more dignified and higher, go through one marriage after another. Not all of them do, but a great percentage of them, while being smart in their chosen fields, fail in their home life. 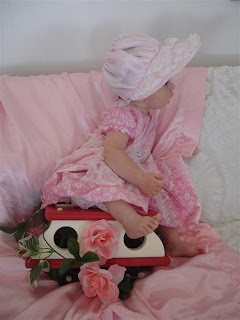 for your husband and your children, here http://thepleasanttimes.blogspot.com/2007/07/babyland-ferry-ship.html My Lily, (my daughter) reminds me of Laura E. Richards, a 19th century author that we studied quite a bit about, and memorized her poems. Laura had four children that she used as themes for her stories and poetry. One of her babies liked to sleep across her lap on his tummy and she said that his back made a very good desk for her notepad. Laura E. Richard's mother was Julia Ward Howe, who wrote The Battle Hymn of Republic. She wrote about her parents and their accomplishments later in her life. Reading "The Babyland Ferry Boat" may make you feel a wave of nostalgia for Laura E. Richards and her children dancing around her in the nursery. When I write about art, literature, poetry and music as being both subtle and great influences on our culture, I wonder if many people understand it. The rebellion of the 20th century removed the great art and poetry which spoke of marriage, home and family. It told of courtship, flowers, loveliness, mothers, babies and beautiful architecture. It reinforces the good and the pure and the lovely in life. Bad art and literature and music tends to bring out more coarseness in young people. I think there ought to be another rebellion, a quiet one, where people throw out these imposters in music, art, literature and architecture, and elevate what is good and truthful and complimentary! The following are some songs that were once very popular. Young men loved to sing them and young women thrilled to hear them. They spoke of marriage, permanence, a cottage for two, and building a life together. Notice the highlighted words, that would make a feminist cringe today. then let us whisper "Goodnight,"
that we have a telephone, dear. A sugar cake for me to take for all the boys to see. Oh, can't you see how happy life would be? We're happy in my Blue HeavenWe're happy in my Blue Heaven! There are several articles on this blog about the Victorian houses and architecture. Now I would like to talk about the cottage structure, which existed long before the Victorian houses were popular in the 1800's. According to some accounts, these homes were built quickly for less money but were cozy and warm and offerred a family safety and shelter. Some stories suggest that they actually had to be built in a day. They may have been intended for temporary housing in the 18th and 19th centuries but their form and beauty still inspire artists. Cottages were owned by the common man. They blended in and complimented the country side in a beautiful way. Many of the homemakers who blog, have transformed their simple tract homes into types of cottages by adding cottage style gardens and gates to them. A real home is where the family dwells. It matters not so much that it is the perfect style, but what that family is able to do creatively, with little money, to make that house a place where they can say they have been happy. Happiness comes from doing our duty. Happiness comes from fulfillng our roles and using our creative instincts. Happiness comes from honoring our parents, and treating others with respect. Happiness comes from being content. Having within our houses things like beautiful art work, even if it is your own creation, or the creation of your children, brings that special feeling of home to a house. Surrounding ourselves with lovely books full of good thoughts also brings this feeling of being happy at home. A person does not have to be formally educated or have a lot of money or achievement in life in order to be happy at home. Over the years I knew other women who were not happy at home. Thinking that I could be of some help, I tried to inspire these women and do things for them, only to realize that they were not ever going to be happy. Some people are just weaned on sour pickles and they will never be happy. I observed that a lot of their unhappiness was feedback from their own critical spirit. They were contradictory, objectionable, and critical most of the time. It hurt their marriages and their relationships at church. They woke up in the morning complaining and went to bed feeling worse because of it. These women never learned to adjust to life, with its ups and downs. It is disappointing to see so many young women, out of school for the summer, whining and complaining about life. They are in the springtime of their years, and they should be happy just to be alive. Many of them are so absorbed in all the little hurts and wounds in their lives that they dwell on them to their own destruction. They never learned about self control and determination. They cannot rise above the winds of life. I read a story about eagles that told how adversity actually lifts the eagle above the winds so he can fly smoother and higher. That is the lesson that young people should learn. I find they are a pessimistic bunch, always ready to criticize. They lack confidence to really love life and embrace and enjoy it. They are so beset with problems that their entire youth passes them by and they do not even enjoy it. I am not saying ALL young women are like this, because there are many nice girls who are happy and who aren't wasting their time dwelling on all the little private hurts and wounds. They are doing something worthwhile with their time. I've heard from many of these girls and they all have some thing in common: their faith and their perseverance in life. If they aren't learning some new skill, they are serving someone in some way. When I was a teenager, my mother and I were sitting in the living room, talking while she was knitting. She taught me to knit, and I can still hear her saying, "In, under, over, off" to instruct me how to knit. An acquaintance that was of the critical sort dropped by and eventually she began to criticise and try to make us feel that we weren't very smart or educated. Everyone seems to have at least one acquaintance like that. My mother let her talk for awhile and then she said, "Now that you've said your peace, I want to tell you something. You may not think we are doing anything important, but can you knit something for someone to wear? Can you bake bread for someone to eat?" Her visitor admitted she didn't know much about either, but insisted that she was very intelligent and smart. Some people are just bent on being unhappy and critical. Criticism seems to make them unhappy, and unhappiness makes them critical. It is not very intelligent to criticise. It is smart to do something useful and create beauty and love around you. Homes where these kinds of activities take place, no matter how humble they are, will always be home to children because it brings them happiness. There was an old ramshackle house that some people lived in and their friends always wondered how the family could be so happy there. They paid no attention to the fact that it had no real estate value or that they had no posessions of any worth. The family was happy there because they belonged to each other and because they loved each other. They had a culture all their own there. I love to look at paintings of cottages and imagine what kind of things might have been going on inside of them. The painter of this one, "Stillwater Cottage," Thomas Kinkade, said in one of his books that the yellow light came from houses where candles were lit or where there was a fireplace. I loved Jennie Chancey's article that talked about having a media rest. http://www.ladiesagainstfeminism.com/artman/publish/LAF_Theme_Articles_13/Back_online_and_updating_again1002818.shtmlThe television and all the screens people use, create a cold, blue light. Having a media fast makes home "real" again and people find happiness doing real things; things that bring continuing results. What is done for others out of our own creativity seems to come back tenfold. Those who practice this kind of happy activity are usually content at home, and most of all, they are available to offer an encouraging word to others. Those who use the internet should reflect the love of their parents and their contentment at home in a way that catches on. Swans Near Gazebo by Chiu, from http://www.allposters.com/ Also check out the other 575 paintings by this artist by clicking on the name "Chiu" or typing it in the search area. They are wonderful. Any by Emily Barnes, including "The Spirit of Loveliness"
Linda Lichter's "The Benevolence of Manners." In is a subject of interest to me that the buildings of the Victorian era are still evident in many places in the world. From Alaska to Tasmania, there can be found a Victorian structure that has been restored and is used to this day. I have seen Victorian homes in New Zealand, countries in Africa, Europe, Canada and even Hawaii. It not only has had a lasting presence but a lasting appeal! I remember though, in the 1950's how some people were burning down such houses, which were called "painted laidies" to make room for modern housing and tract homes that would make more money. A society was formed to step in and rescue any house that was a hundred years old, and some houses that were 50 years old. This was called the Historical Society and they were able to put a stop to the razing of these houses. When I post here of my interest in Victorian homes, it is for several different reasons. One is that it was never one particular style, but rather the time frame (the period of time in which Victorian was Queen of the British Empire), and another was the versatility of the styles. They looked good in different settings, whether they were by the sea or in the mountains. They could take on different national qualities, depending on the country, the climate, and the materials available where they were built. Everywhere you go, you can see them. There are in Russia and India, for example, still beautiful Victorian homes. These plans are still used today. I was walking around in a new housing development not long ago, which was entirely Victorian in nature, and yet could name some of the styles listed above. These houses had several things in common. One of particular importance that modern homes do not always include, is the front porch that people may sit on. It was important in past centuries to have this as an extra room. There they could keep an eye on their neighborhood and their children and keep in touch with others. The front porch went by the way when some of the more modern homes began to be built. However, in the 1960's-1990's houses, many people are giving them a facelift, by adding porches and upstairs sections, creating a more Victorian look. The reason I like the Victorian houses is that I know that the era was so staunchly family oriented. The home was considered the most important element of society. As the home goes, so goes the nation, they said. It was a time when a man's greatest accomplishment was to provide a nice house for his family, and women felt dignified by having a home all their own to take care of. It was a time when church and family were the highest order of society. In “Words of Comfort for a Discouraged Housekeeper”, she writes, “In the first place, make up your mind that it never is your duty to do anything more than you can, or in any better manner than the best you can. And whenever you have done the best you can, you have done well, and it is all that man should require, and certainly all that your Heavenly Father does require.” In “For the Sick”, she advocates the use of, and shows how to construct a homemade waterbed or “hydrostatic couch” as well as a “rolling chair”, i.e., a homemade wheelchair. Now that I've shown a Victorian citizen who did good, some of you may be excused to go look at beautiful Victorian things. If it were not for the tastes of Queen Victoria, we would perhaps not have such lovely shops depicting the roses and chintzes and tea cups of the era that are still so appealing today. And now I would like to relate the story of another woman, who lived long before the Victorian era. She was the first published woman in slavery and she wrote this poem in her book, "Poems on Various Subjects, Religious and Moral"
I strive To comprehend thee. 15: Attend me, Virtue, thro' my youthful years! For those who might be depressed or discouraged about the bad Victorians, you might not want to read the following. John Dewey: - He is perhaps known as the inventor of modern education. He admired the German army and sought to set up a school system similar to military training, by grouping children in ages and grades, and keeping them to a strict curriculum that was limited to the dictates of the education system. They were in essence, trained over a period of 12 years to become young socialists, which is what we are still seeing today. He believed that only through education would man get "better and better," but as we now see, it did not happen. You can read about John Dewey and the decline of American Education here http://www.isi.org/books/content/367front.pdf Be patient while these pages appear. There were various politicians in the Victorian era who espoused the doctrines of Darwin, Marx, Dewey, Sanger, and Frued, and infiltrated such things into our judicial system, or laws, and our government at every level. My husband did a sermon once called "The Power of One," and he included these people in describing the destruction they levied on our current generation. One such man worked tirelessly to get rid of the foundations of our laws, one being "Blackstone's Law," a law book that most lawyers and judges used, which was based on the moral laws of the Bible. In the 20th century, some of the proponents of this movement celebrated the removal of Blackstones Law from the law schools (around 1963-4) by announcing, "Thank goodness, we finally got rid of Blackstone!" Now, the courts could make up the law as they went. They could judge according to their own feelings and beliefs, many which were based upon the philosophies of Dewey, Darwin, Freud, Sanger and Marx. These people, combined with others of the Victorian era in other movements called socialism, liberalism, fabianism, materialism, existentialism, and more, sought to replace the family and the Biblical mandates to do good to others, with a state that people would look to as authority. The names of the movements have changed, but they still seek to break down the home, home life, and the meaning of the family. For those who believe all I do is glorify the Victorians, this should satisfy you plenty. Why should the influence of these ungodly men be hailed more mightily than the influence of other people of that era? It has a lot to do with how you were indoctrinated in schools and colleges. You probably heard that the Victorian era was full of prudes who didn't allow freedom to women. This was a mantra people spread in the 1920's to discredit their Victorian parents and get rid of the moral restraints of the time so that they could freely usher in a new age of rebellion in music, art, architecture, education, fashion, and just about everything else. That generation was heavily influenced by the Victorians Marx, Darwin, Dewey, Freud, and many others who thought they knew how this world should be run. The beliefs of these people transcend to the current modern times. We now have more abortion, more immodesty, more divorce, more illiteracy, more bad architecture, bad art, misspent government money, depression, drugs, alcoholism, and even persecution of those who want to claim the Bible as their rule of authority. Watch the ads on television and you will see that most of them are offers for cures for all that ails mankind today: heart disease, cancer, depression, and more. It may seem confusing to understand the teachings of these impudent Victorians, so to make it easy I will sum it up by saying that they all despised absolutes and standards and sought to destroy the rules of good behavior, Biblical principles and the restraints of authorities like parents and good government. Their doctrines were based on the selfishness of mankind, and opened up a floodgate of problems that leaked into the 20th century which still plague our families today. It translates into an attitude that people can do as they like, and if it is rude and you don't like it and want to put a stop to it, you are an intolerant snob. What does any of this have to do with the role of wife, mother, homemaker, or daughter at home? These belief systems invade the home and make the family unstable. As home keepers we are supposed to guard the home. These distructive philosophies of life come into the home via the media, the mail, the schools, music, literature, the new laws that are made, and even infect things like the way our food is produced, the way our houses are built, the arts and crafts of our era, and the way our government is run, if we allow it. The home is the last frontier of freedom, where the practices that make it good can be quietly inforced. The homemaker can determine to put what is good and lovely into her life and her home. She has more power to create loveliness in the era in which we live, than the world knows. It is because of the philosophies of these men that women do not even believe they are allowed to stay home and be keepers of the home. Almost from birth, they are taught through education, psychology, and socialism, that they do not have a choice to stay home. Most girls come out of high school not knowing that they have other choices. If you are having trouble with rebellion in your home, your children may have been indoctrinated with these false concepts of life and are are war with the values of their parents. These are doctrines we all need to be aware of and be able to refute. Yes, there were bad people in the Victorian era, but like today, there were people who refuted them and taught the truth about life. It will always be a challenge and a duty of each generation to do such. Due to the recent embroilio on the Victorian article regarding the family habits, I am cutting off comments. Emails are welcome if there is something of importance that I should look at. Homemakers I'm sure get similar problems in their lives. Women often have problems with people who constantly attack their way of life. There are friends and relatives and even strangers who question their right, their ability or their sanity. I would guess that homemakers are so swamped with work to do that they barely have time to get involved in a debate about whether to stay home and concentrate on managing the home and getting it in ship-shape. It is easy to get caught up in such debates but it can leave you feeling rather sick and then it debiliates you to the point that you cannot put the joy and the beauty and love and order into the home and the family life that you really want. These naysayers, these negative thinkers, these bitter, jealous people, can really give you a go. Their comments can distract you from doing what needs to be done. The best argument in favor of what you are doing at home is to do it. My mother had 7 children and it was not until the early 70's that feminists began to attack her. She looked at them like they were very daft, when they said, "What do you do all day?," "Why don't you work," "Why did you have those kids?" and other more insulting comments. She said to one person who was trying to get in an argument, "You know what my advice to you is: just don't worry so much about me. I'll be alright. You just mind your own business." That is what we can do and that is what they can do. The best way to prove a belief is to live it, and to our comfort, generations of women before us have done it and they did not end up living under a bridge. As one statesman in the early 20th century said,"Being a homemaker is better than a high college degree. You can't do better than working at home and making it a haven of rest for the family, raising upright children and having a long-lasting marriage. There is nothing better." I went to the public schools in my youth and I recall the subtle and not so subtle attitudes that were taught about the home. We were told that if we wanted to do better than our mothers, who were "just homemakers" we would have to get an education. Education was power, they said (instead of the former saying "Knowledge is power") and so if we followed their system, we wouldn't "have to be homemakers." Instead, we could be "liberated" from that life and be "allowed" to work 8 hours a day at another career. They never told us how we would squeeze in housework, marriage, children, etc. or how in the world we would stand up to the stress, physically. They never told us the statistics that existed even at that time, about the many children who were neglected by this system. Now we find there is a quiet revolution of sorts, with women saying, "If you say I have a choice, then let me have my choice to be home and take care of the children, my husband, the laundry, the dishes, etc. Let me be organized. Let me be artistic. Let me choose when I will rise up and when I will sleep. Let me choose how I will make money and spend it." On this blog, we've tried to put a few inspiring stories and examples to help us all understand the worth of the homemaker and how she contributes to the home and to the business world and to the nation. We don't need to spend a lot of time defending it because we live it and it works. The ones that don't agree and don't like what is being said, should take a good look at themselves: are you really happy? Is your laundry caught up? Do you have clean sheets on the beds? Is the bathroom clean? Have you taught your child anything today? Did you pack your husband's lunch? Are you available to listen to his ideas? Are you clean and well dressed? Have you gotten rid of bad habits? Are you consistently engaged in arguments with other people, either online or off? Are you on time for appointments, or do you inconvenience others with your tardiness? If you are really happy and you have your life together, there doesn't seem to be any reason to attack me. It is a tremendous waste of energy that could be spent in creativitity. If you have time to debate people you have time to start your own little business at home and do something worthwhile. I realize some of the comments came from kids that read my parents blog because they found someone that stands up for authority and for order in the family and will not sympathize with adult children that run all over their parents. Parents can't be who they are supposed to be, and cannot have lovely homes and families if there are dissenters in their home that destroy the peace. It is the same with this blog. It is hard to be a homemaker when others are arguing about whether or not you should be doing it. I've enjoyed the Cottage of the Month, the Mantel of the Month, and the Shabby Suite of the Month, which you can see on the sidebar under "Other People's Houses." These are sites that feature boutiques that sell embellishments for the home. Each month, they feature someone's humble home that is made to look elegant by dressing it up and displaying things that bring joy to the heart. I've lived in a number of what we might call "unfortunate circumstances" and have come to recognize that it is not so much our income that matters, as to how we live our lives. Once you allow beauty to take over your home and your being, you are rich. As I get older I realize that whining about the kind of house we live in or our income, results in a memory that cannot be erased. We have to make the best of things. How will the next generation remember us, as a people? We we depress them, or will we inspire them? ...on The Pleasant Times. Mrs. Humphrey hosted a parade, with the army, the fire department and the salesmen! Years ago we decided to celebrate our independence by having our own parade and our own celebration, free from the crowd, from the dangers and the loud noises. Firecrackers frightened my baby and I decided it was not worth going to some of the public celebrations, finding parking, and being in the heat. Ever since then we have had our own harmless fun. Read more about our flameless firecrackers at The Pleasant Times . Painting "Seaside Memories" by Susan Rios. Quotes by Victorian authors: "There is in this world no function more important than that of being charming--to shed joy around, to cast light upon dark dys, to be the golden thread of our destiny and the very spirit of grace and harmony. Is not this to render a service?" "Her presence lights the home; her approach is like a cheerful warmth; she passes by, and we are content; she stays awhile and we are happy. Is it not a thing of divine, to have a smile which, none know how, has the power to lighten the weight of that enormous chain that all the living in common drag behind them?"